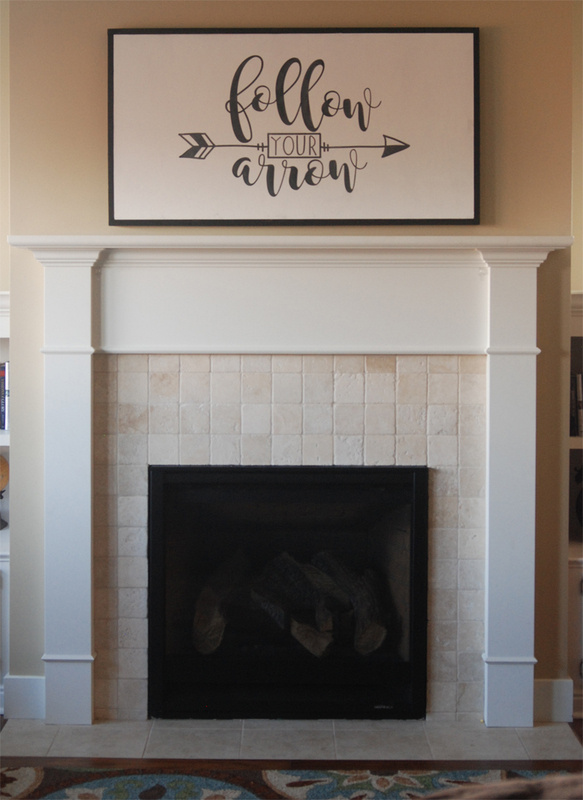 One feature of our new house I was really excited about is the fireplace. I have always wanted to have a fireplace and mantle to decorate. Our previous home didn’t have one and at Christmas time, I actually made a faux fireplace to decorate and put stockings on. Well, we have lived in our new house for 7 months and I hate to admit that quite a few holidays have passed where I haven’t decorated it. With my commitment this year, to less procrastination, I am already tackling the mantle for Valentine’s day. 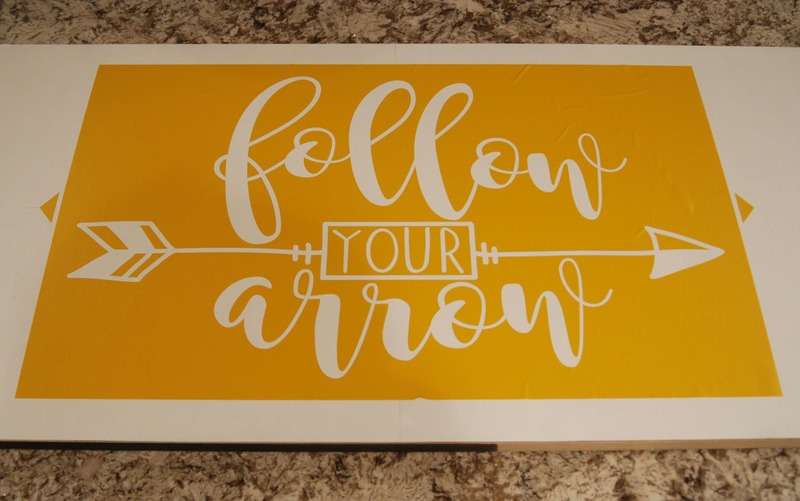 I still have to find or make all the little accent pieces, but this week I finished up this large wood sign and I LOVE how it turned out. Disclosure: I was not compensated for this post, but will earn a small percentage for sales as an affiliate. As always, all opinions are 100% my own. I don’t do a lot of building, so I like projects that are simple and quick and I thought this one fit the bill. I didn’t really take measurements. But, I’ll show you the basic steps I took to make it. 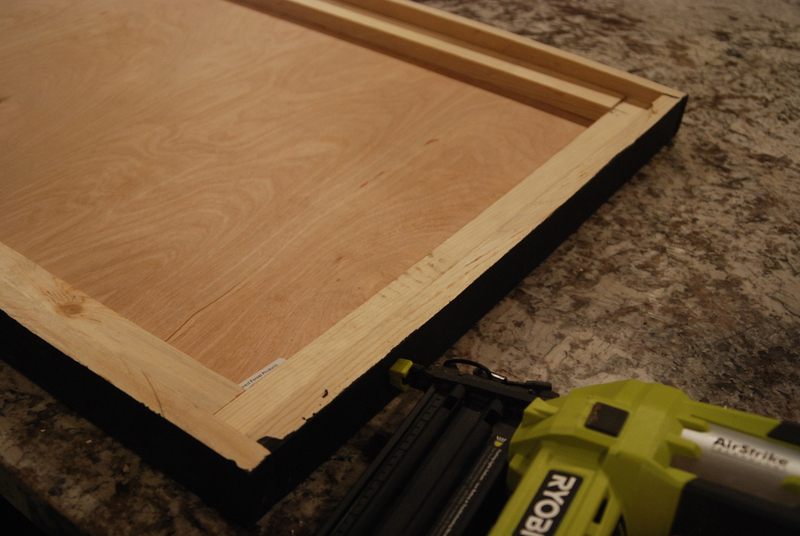 I started by gluing strips of 2″ wood around the edges. 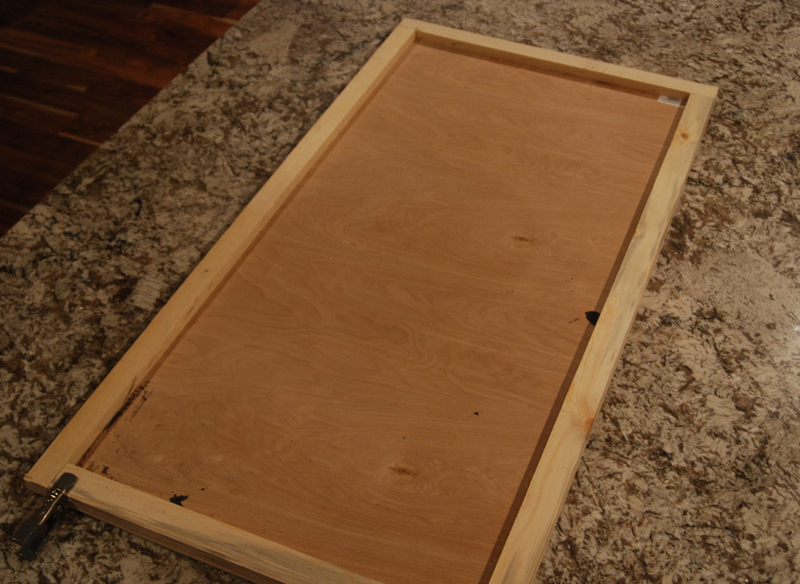 My piece of wood was thin, so I needed to add these so I would have something to nail the frame to. I flipped it over and painted the top white (whoops, no picture). I cut out my vinyl stencil, removed the excess vinyl, and applied it to the wood with my transfer tape. 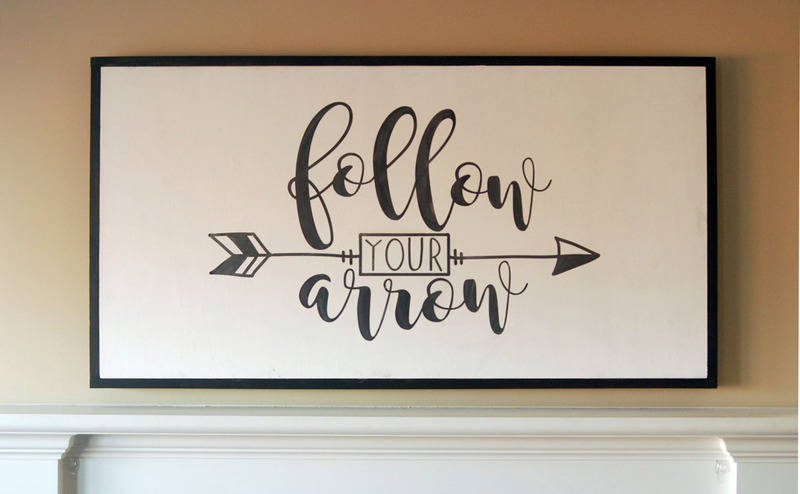 The little arrows are to help center it. Depending on the size of the design, you might need to cut it in sections. To help prevent paint from bleeding under the stencil, I painted a light coat of white over the vinyl. I put white and black paint on a plate and mixed them together just a bit. I didn’t want the paint solid gray, so that’s why I didn’t mix it completely. Then, I started painting. Once the paint has dried a little, I removed the vinyl. Can you see the variation in color? I think it looks pretty neat. To add some bulk to the sides, I glued and nailed on some 2″ strips I had painted black. Then, I added some D rings and wire to the back for hanging. 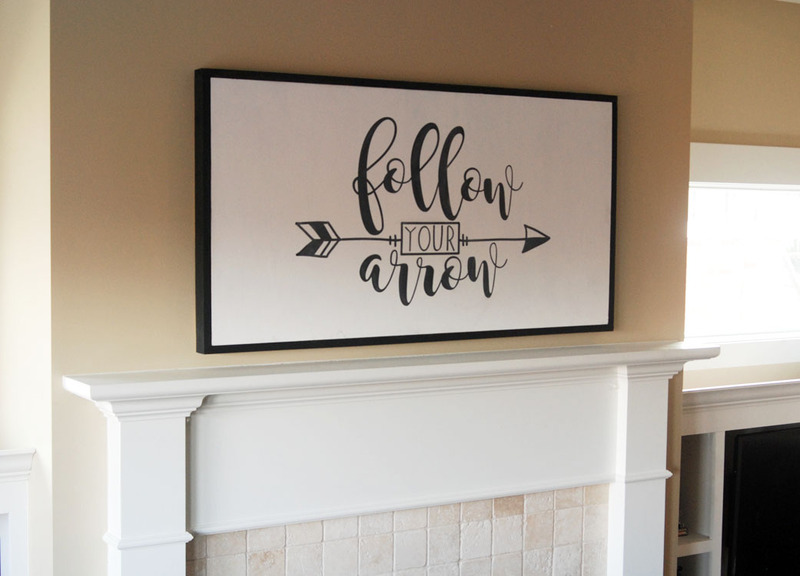 And then I hung it above the mantle. Now, I just need some cute Valentine accessories to finish it off. Don’t you love the font? I do! It’s Magnolia Sky from creative market. So cute! Want to make your own? You can purchase the cut file below. 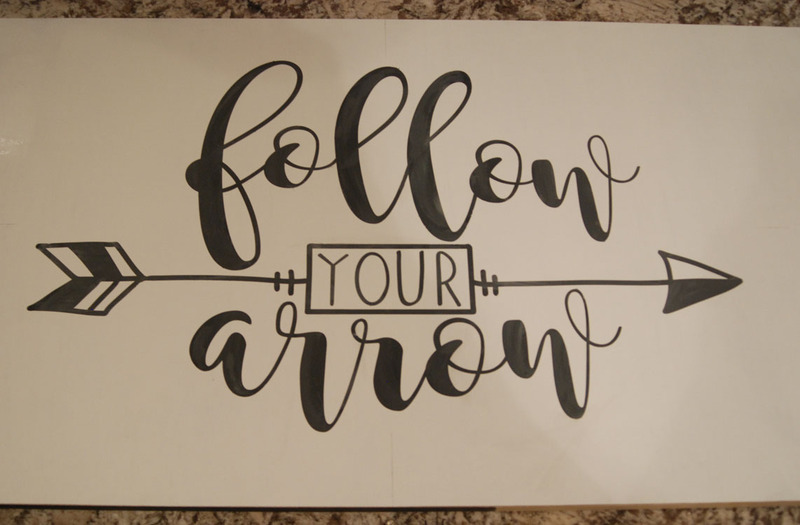 I really like your sign follow your arrow. I’m going to try to make it. 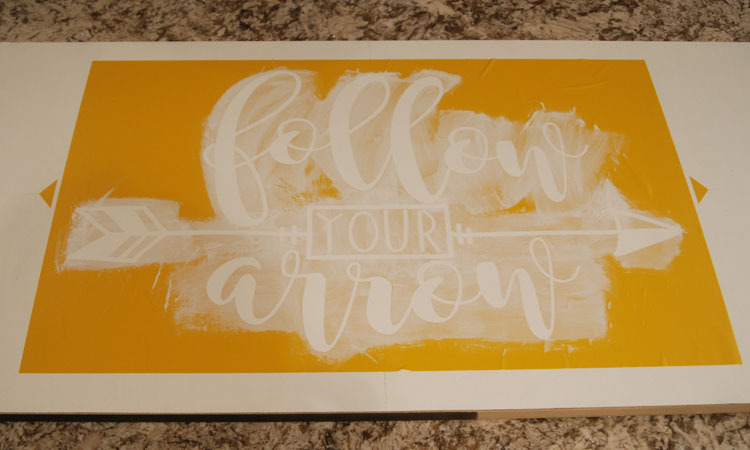 Im just in the learning process with the cricut air. Thanks for sharing.